One day in late August, my husband noticed a tiny bird on our driveway. 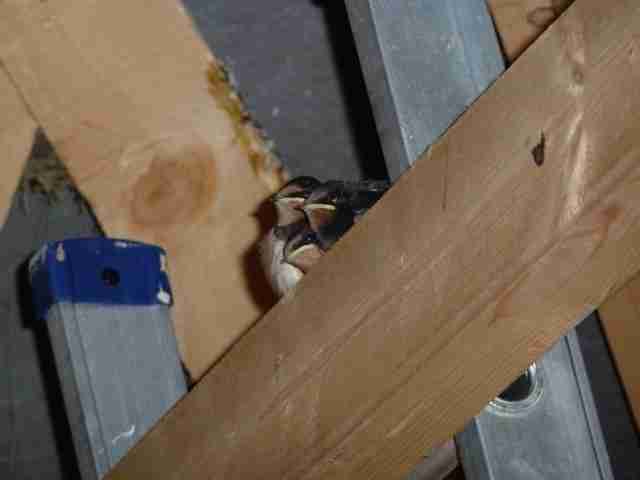 Our garage was in the process of being built, and so the open access meant that swallows had been nesting in the high beams all summer. My first thought was that this was an early fledgling (it had feathers), and so to not disturb it. We kept a periodic watch from the kitchen window, but no parent ever seemed to approach it, nor did the little bird move. I eventually moved it to the inside of the garage, underneath the beams where I knew was a nest. Night was falling and the bird needed protection. My brother-in-law even set up a video to see if a parent was paying any attention. Nothing! By late evening, it was clear that the bird was very weak, no longer peeping, and would certainly die overnight. Fledglings should not be put back in the nest, yet this one was such a young one that I was sure he had just fallen out prematurely. I had enough! I took him inside the house, put a clean soft dustrag in the bottom of a tiny basket, and placed him in there. I put him in our warm utility room. Then I did some research. 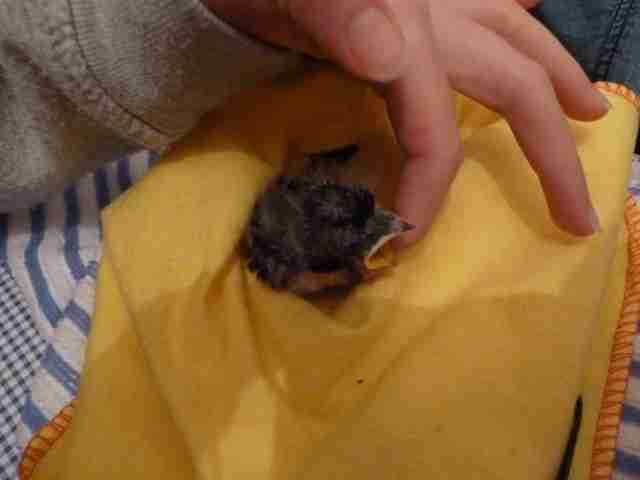 The advice is to feed baby birds with mealworms soaked in water. Luckily I had a bag, so I threw some in a small dish of water, got some tweezers and started tempting him to open his beak. He was so weak, but after a while, got the idea what I was trying to do. I kept feeding him until he stopped opening his beak. 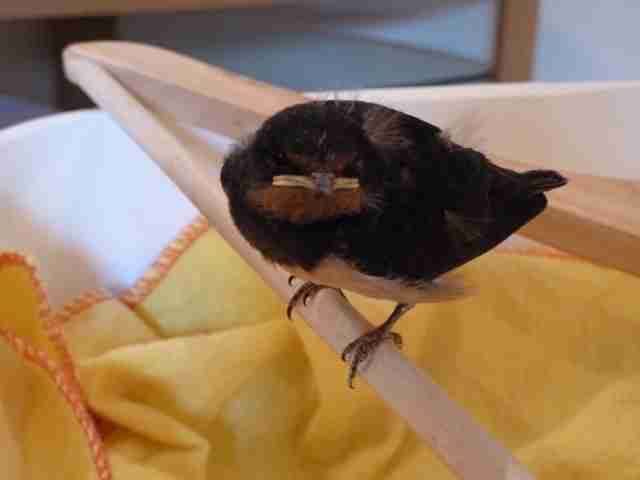 In the morning, I thought he was too weak to survive, but I kept feeding him hourly. And by the end of that day, he was peeping every time he wanted worms! I changed his bedding daily, keeping him warm in his basket, and moved him into our kitchen. I named him Robert, after the quail in my favorite childhood book "That Quail, Robert." Every day, he looked different, with his feathers maturing. I moved him into a bigger tub, and after five days, I thought he might be ready for flying lessons. Meanwhile, we were keeping an eye on his siblings in our garage. The intention was to place Robert up high on the beams as soon as they started fledging, hoping he would be able to reintegrate. I placed a wooden coathanger on his tub, so he could learn to perch. In the spare room, I started teaching him to fly. I threw him gently in the air so he could flap his wings, and then he would plop on the bed. After a few times, he actually started to fly when I did this: not able to control his direction, but flapped a few feet haphazardly. And then his siblings fledged! We placed Robert on the beams near his old nest where the others were congregating. The parents were continuously in and out feeding their offspring, and we kept a constant watch on Robert. Would he know what to do? Would his parents ignore him? Finally, finally, we saw a parent feeding him! A blessed relief! He was accepted! It took another week of parental flying lessons and feeding inside the garage, until one day in mid-September they were all gone. The nest was empty, no sign of any chicks (dead or alive!) inside, so the assumption was they were learning in the air, preparing for their autumnal migration. And sure enough, until the end of September, we kept seeing this small group of swallows in the air above our garden. It was easy to tell the adults from the youth by the way they dived and flew; the little ones were buffeted about more, the older ones stronger in their movements. I only had Robert in my house for one week, and yet it was one of the most transcendent experiences of my life. 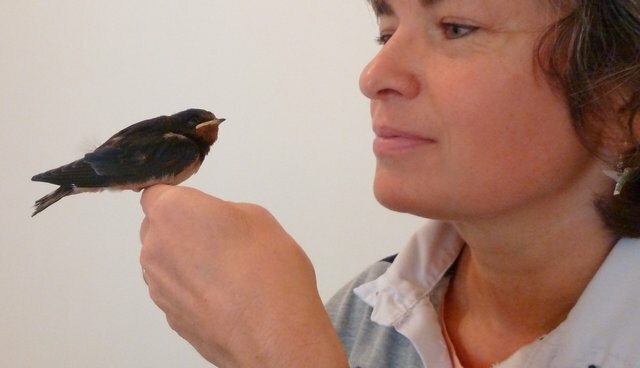 Nature is cruel enough, and perhaps one shouldn't interfere, and yet, why not offer a helping hand to any living creature when you see the opportunity?